CAUTION: I don’t trust my own arithmetic in this post. If anyone would like to take the time to go through the arithmetic and share their numbers with I would greatly appreciate it. Source of data: With analysis from Origin Energy, data includes all of Australia: the National Electricity Market (QLD, NSW, Vic, SA, TAS), plus Western Australia and the Northern Territory, but excludes Mt Isa. Embedded generation data sourced from State of energy market report 2014, Australian Energy Regulator, WA FY12 data from Greg Ruthven 2012, Statement of Opportunities Pre-Launch briefing, Independent Market Operator 2012 and NT FY13 data Energy Supply Association of Australia 2012, Electricity Gas Australia 2014. 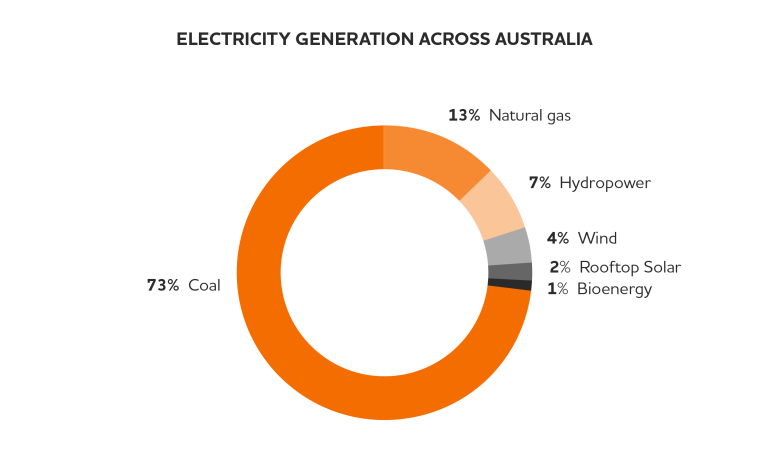 Coal and natural gas generate 86% of Australia’s electricity needs. The IPCC report therefore gives Australia and the rest of the world 32 years to convert 86% of Australia’s electricity needs from coal and gas to renewable energy. Tragically, from 18 September 2013 until today (Oct 24 2018) successive Federal governments have refused to act upon the findings of science regarding climate change. As a result, though the older of the Australian coal fired power stations have closed, and though energy companies are reluctant to further invest in modernising current coal fired power stations open. Power companies, as I understand it, prefer to investment in solar, wind and, where compelled, gas fired plants. 86% of 196.2 terawatts is 168.7 terawatts. Can Australia decommission all of our fossil fuel plants and erect an additional 168.7 terawatts of renewable non fuel generating capacity over the course of the next 32 years? Such a task, should Australia’s politicians accept the nature of reality as described by science would require the construction of renewable generation capacity of 5 terawatts of power per year, every year, until 2050. That’s the slowest will can go. Political conservatives remain steadfast their call for a new coal fired plant based upon latest technology. 1 kilowatt is 1,000 watts. 169,000,000,000 kilowatts over 32 years. I have a 3 kw solar panel installation on my roof. It would take an additional 56,333,333,333 homes like mine, plus the appropriate amount of battery storage, to meet the requirement of no fossil fuel electricity by 2050. It’s a lot of juice. Clearly, industrial scale renewable non fuel generation installations are the surest way to add 5 terawatts of power per annum to the Australian grid. Along with appropriate battery or pumped hydro capacity. Sadly conservative politicians generate political instability within and across parties when ever a Prime Minister accepts the scientific nature of reality. This political instability has continued for at least the last five years and promises to continue. The debate regarding climate change in Australia remains unresolved at the political level, and currently the debate has been splintered. If conservative only understand how to count money, and understand nothing about how to read scientific papers, then the recent decision by our latest Prime Minister to focus only upon the cost of electricity to consumers while complying with climate agreements signed to date (a concession to reality which none the less threatens the Prime Minister with party room revolts and exile), may seem wise. If the Prime Minister’s claim that he can lick the problem with a “big stick” is correct, ordinary voters may well become less survival driven and more self actualising when it comes to the cost of building non fuel renewable power plants. Spare the rod and spoil the power retailers ScoMo. And convert from coal. Reducing the power generators profits via ScoMo’s big stick will mean probably government assistance to build the required 5 terawatts of new renewable plant per year for many years. I suppose no government ever asked how much entering a war would cost nor whether we could afford such a war. This situation really, at the government level, is no different, though we did blow a lot of dough on wars from Vietnam to Afghanistan to Iraq. Pity. $750 per each Australian artillery shell did seem a bit steep to me in 1972. It’s all relative and depends on the lobbyists in Canberra I guess. Barry and Ben Ask: How Many nuclear reactors is that and how long to build each one? I refer to the Westinghouse AP series reactor. 169,000,000 megawatts of non fossil fuel power by 2050. How many AP1000 reactors is that? My calculator says 151,298 reactors. Each AP1000 has 157 fuel rods. These need refuelling once every two years. How many fuel rods averaged to per annum is that? 151,298 x 157 = 23753786 fuel rods. Converted to an annual number of fresh rods, that a consumption of 11,876,893. Surely we wont be importing all those rods. So how much power does it take to mine, refine, refine and assemble a fuel rod? I don’t know yet. I would say that given, from memory, the proposed expansion of Olympic Dam would have, had it gone ahead, required an additional electricity supply of 750 megawatts. Which was not present in the national grid at the time. Or something like that. My memory might be out on that. Check me. How much water is needed to cool 151,298 reactors? Is there enough water in the Gulf? Where will all those spent fuel rods go? French? New Zealand? Port Willunga? How Long does it take the United Kingdom to Build a Westinghouse AP 1000 reactor? Westinghouse commenced the UK approval process for 3 new AP1000 reactors in 2011. After requiring 51 changes be made to the design, approval for these reactors was granted by UK authorities in March 2017. Sadly, the initial thrill of the British people was dampened in July 2018 because; “Doubts have been raised over the fate of a new nuclear power station planned for Cumbria after it emerged that most of the project’s 100 UK staff are set to be laid off. Toshiba has been trying to sell the NuGeneration consortium behind the Moorside plant since it had to write off billions of dollars because of problems with its US nuclear business last year. The Korean state-owned firm Kepco appeared to swoop to the rescue last December by agreeing to buy NuGen but the sale, which was meant to complete this January, was then delayed until the spring. The transaction has still not closed, and uncertainty has been created by a change of government in Seoul and the appointment of a new Kepco chief executive. The delay has forced Toshiba, a Japanese corporation, to look again at the consortium’s running costs, leading to a decision on 27 July to cut many of the venture’s 100 jobs across Manchester and Cumbria. The job losses will be subject to consultations. If the acquisition were to collapse the failure of the Moorside project would leave a large hole in ministers’ wishes to encourage the construction of as many as six new nuclear power plants to meet climate goals. Damn, how upsetting. They didn’t talk about this on Sixty Minutes, Ep 34. Ben said boo about it. “Toshiba’s UK nuclear subsidiary Nugen has confirmed that the £10bn Moorside plant will be delayed several years beyond its previous 2025 opening date. Speaking to Reuters, Nugen chief executive Tom Samson confirmed that the project’s search for a new investor following the exit of Engie was “ongoing”, and had pushed the opening date back to the late 2020s. Mr Samson said: “There are multiple credible bidders and we expect to find a new buyer, and a clear way forward by early next year. The new nuclear plant had been expected to provide up to 7 per cent of the UK’s energy needs. However, the project was put in jeopardy when Toshiba’s US nuclear arm, Westinghouse, filed for bankruptcy in March this year. The Japanese firm was then forced to buy out Engie’s 40 per cent stake in the project after it pulled out in April. In May Nugen launched a review of the entire project, with rumours subsequently emerging that Chinese investors had shown interest in the scheme, having taken a 33 per cent stake in the £18bn Hinkley Point C project.” Source: https://www.constructionnews.co.uk/markets/sectors/nuclear/moorside-nuclear-plant-delayed-until-late-2020s/10024094.article Construction News, Oct 2017. So how long to build an AP1000 in England? I don’t know. The approval process was started in 2011 and the new proposed opening date”could be” 2030. If so 2030 – 2011 = 19 years. total time to go online. Great Scott!! The cost is unknown to me. And by the look of it to everyone else involved. So if an AP1000 was built in Australia how much would it cost? No one knows. How long would it take ? No one knows, because 1. unlike Britain there is “no social License” for nuclear power in Australia. 2. Current Federal Law makes such installations and their enrichment plants illegal. 3. After trying to gan social permission to establish a permanent low level nuclear dump in Australia since circa 1972, no such permission has been achieved by government. It is therefore likely that while the industry advocates and lobbyist/sales staff think 5 years should do it, it is highly unlikely that politicians will be granted social permission by Australians to build nuclear plants and associated regalia such as enrichment plants and rod assembly halls. Without this social permission, no government can expect much of a life span if that government changed Australian law to render nuclear power plants and fuel enrichment legal in Australia. Given that Westinghouse and Toshiba are bankrupt, would Australian authorities consider China a source of cheap reactors? Given the fact that Australian authorities do not trust the Chinese government with even a 5G network would they trust the Chinese with the supply and construction of NPPs? i do not think so. And that says nothing about China’s technological ability, which, from what I have seen, is world class in such things. Australian authorities are worried enough bout the security of uranium Roxby let alone fission products in a Chinese reactor which might, if Cory gets his way, be built at Pt Augusta. And there is no way to estimate time and cost from planning to going online. It will not cheapen the cost of electricity, if at all, for about 2.5 decades. Minimum. “A second Westinghouse AP1000 nuclear reactor on China’s eastern coast is now ready to go into full commercial operation after a week-long trial run, the project’s operator said late on Tuesday. From construction start in 2009 to going online, the time taken in this instance was 9 years, which is pretty good. However, the complexities of the process are mentioned in the above article: “China gave the go-ahead to build four Westinghouse-designed AP1000 reactors in 2007. The first unit at Sanmen in Zhejiang province was originally scheduled to go into full operation in 2014, but the unproven “third-generation” technology has been beset by years of delays as a result of safety concerns and unanticipated design problems. Unit 1 at Sanmen was finally declared ready to go into full commercial operation last month, making it the world’s first AP1000 reactor to be completed. Westinghouse, owned by Japan’s Toshiba, hoped China would serve as a shop window for its AP1000 design, which boasts enhanced “passive” safety features as well as higher levels of generation capacity. Westinghouse filed for bankruptcy last year after its nuclear projects in the United States were also hit by billions of dollars of cost overruns. China also hoped that AP1000 technology would be at the center of its own ambitious nuclear power plans after signing a technology transfer agreement in 2006. But after a root-and-branch industrial safety review in the wake of Japan’s Fukushima disaster in 2011, China’s nuclear program has slowed considerably, and it is now unlikely to meet its 2020 capacity targets.” source: as above. I guess the Chinese know some things Mr. Heard refuses to say in public or which he doesn’t know. Despite his implication that he knows all that is relevant in reality about Fukushima. Yes, by all means read that three times and compare with the source. I didn’t realise the accountants at Forbes were so anti-nuke. Then again, they might have made a mistake. China has a very low unit cost for reactor construction compared to the US and Europe. Workers on Chinese nuclear sites enjoy extremely good food and high class living quarters. Much as the workers at the Apple factory do. I guess. Let us say the required number of AP1000 based Chinese reactors could be built in Australia by 2050 to meet the needs of the IPCC recommendations, how much would it cost? 151,298 x 10.2 billion US dollars. 1,512,980 Billion. Port Augusta’s solar thermal plant – is it an answer? Approval for this plant was granted by the government recently. It will cost $650 million and will generate 150 megawatts, will store 1,100 megawatt hours of power, providing 550 gigawatt hours of power per year. The plant is designed to last 40 years without major component replacement. $A650 million to build with 150 megawatt generating capacity. 24/7 power delivery. Port Augusta is also the home of one of the biggest PV solar plants in the world. Let’s look at that. “Australia’s biggest solar farm – the 220MW (AC) Bungala solar project near Port Augusta in South Australia – has begun production marking the important first stage of the transformation of a former coal city into a major renewable energy hub. It seems to me that the cost of replacing all of Australia’s coal and gas fired generation capacity by renewables over the next thirty years will be extremely high. Whether Australians and Australia has the will to comply with the actions needed to cease CO2 emissions by 2050 remains to be seen. Some of the figures I have come up with in this post seem fantastic and I have asked a qualified person to check my findings regarding the numbers. One thing is certain. One or two or even 5 nuclear reactors built in Australia will NOT produce zero CO2 emissions from power generation in Australia because not even 5 such plants will replace coal and gas. It will take many more NPPs than that to replace coal here. The same is true of fuel-less renewables. Many, many plants like the Port Augusta solar thermal plant and the nearby Solar PV will also need to be built. While domestic demand may likely be met by rooftop solar and batteries, it could well be that heavy industry will require access to a national grid even if domestic users by 2050 see little use for the grid as we now know it. Unlike solar and wind, the consequences of grid failure which last longer than the emergency cooling systems of nuclear power plants are designed for (8 hours, for both Fukushima type and Westinghouse AP 1000 type) may produce technical situations in which instead of merely boiling water, the reactors instead melt uranium and steel. As happen to four reactors in March 2011. Of course, had Fukushima NPP had its backup batteries connected to roof top solar panels, the batteries would not have gone flat and the disaster might have been, in large part, averted. It won’t be until about 2038 that humans will be able to safely enter the reactors in order to find out exactly components of the ECCS were wrecked by the quake. Reactor one’s emergency condenser should have been inspected by the Japanese Parliament’s investigation team, but TEPCO lied to the team and forbade them entry. It remains highly likely in the view of that team that the reason why Reactor exploded early was the failure of the emergency system due to quake damage (see previous posts.) It is my view that you can trust sales staff to sell by any means. The brochure hander outers of industry cannot be expected to tell the whole truth. Buyer beware. If we must have an energy generation mix, gas, wind, solar PV, solar thermal and Hydrogen seem to be the go to me. I wish England all the best with the construction of the Moorside Westinghouse units, here’s hoping the cost over runs are not too many billions, and that some companies will be found to replace the ones who have gone bankrupt and pulled out. Luckily for China’s nuclear industry, its government is communist and does not have to make a profit fulfilling is 5 years central plans. Lucky too that Chinese labourers are treated to pay and conditions which are the envy of the free world. Not. How much would a Chinese reactor cost to build in Australia with Australian workers? Or hey, should we just leaflet bomb Beijing with 451 visas? Arithmetic is pretty much the opposite of ideology. Rooftop solar is not the answer, merely a domestic part of it. Neither is nuclear. One or two will not achieve zero emissions by 2050. Even if two do manage to get approved and constructed by then. While those who maintain that only nuclear can save the world (again), the arithmetic, the social, the political, the environmental, the proliferation and the financial costs from that undertaking and borne by other industries such as agriculture all converge to produce a conclusion in my mind that the resulting chaos in Australia will impose consequences no one would want to live with. China’s power elite are lucky. For those who disagree there is at least one concentration camp ready to take them, and jails full of people who end up having their bodily organs sold on the medical market. Perhaps it was not the failure of nuclear power in the free world which bankrupted Toshiba/Westinghouse and GE. Perhaps it was just plain old Karma. China, despite its brilliance and despite its wonderful people, is not, as a political force, not a guiding light to me. It is an arena of darkness and an enforcer of amnesia upon the spirit of humanity. It has lifted billions out of poverty yet inflicts such suffering I mourn it and protest it. We are lucky. We are still free to think for ourselves and to vote without fear. I vote no to nuclear. One person, one vote. Next: The fuel delayed by decades. Hydrogen. This entry was posted in Uncategorized on October 24, 2018 by nuclearhistory.